APMEX, Inc. is excited to announce the latest releases from KOMSCO , the South Korean Mint with the 2018 1 oz Silver Chiwoo Cheonwang and 2018 1 oz Silver Tiger medals. As the official South Korean Mint, KOMSCO introduced the country’s first bullion series with the Silver Chiwoo Cheonwang medal in 2016. Since that first release, the series popularity has skyrocketed. With limited mintages, as well as 1 oz Gold and 1 oz Proof Silver releases, the 2018 1 oz Silver Chiwoo Cheonwang medal has been highly anticipated. The latest medal comes with a new design, showing a close-up of Chiwoo Cheonwang in military dress on his legendary horse with his sword ready to strike. The other release from South Korean Mint is the first of a new bullion series. This Silver medal features the endangered Korean Tiger. The inaugural design shows a beautiful tiger among bamboo shoots with its mouth open, as if roaring. The reverse depicts a Korean map made from letters of the Korean alphabet, the national emblem and a latent security feature. 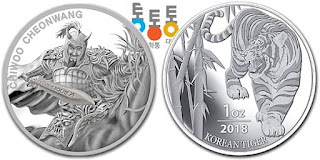 The 2018 South Korea 1 oz Silver Tiger medal has an extremely limited mintage for a bullion series with only 30,000 available worldwide. These latest issues from KOMSCO are ones not to miss. From the popularity of the Chiwoo to the new Tiger series, these limited mintage releases are great additions to an already treasured collection. You can pre-order these Silver medals now at APMEX.